Dress shirt collars comes in various shapes, sizes and style. Understanding and utilizing the collar is an important lesson in men’s fashion. The choices are limited if you buy MTM shirt or off the rack shirt; that’s the beauty of getting a hand made custom shirt. Men usually stick to a few collar shapes; but becoming confident with all the small details of a collar broaden your fashion sense and enable a man to add his personal style to the dress shirt. The right collar can change the tone of an outfit from average to amazing. We believe in having a mix of collar styles in your wardrobe; don’t stick to one. To suit every occasion possible, play around with every collar; right from wide cutaways to button downs; etc. Most bloggers or brands would suggest you to get a collar that correlate with your face – e.g. if you have a long face, you should be using spread collars or if you have a square face, you should avoid point collar. We think this is complete nonsense and complicate things. One can enjoy all sort of collars and adapt them to fit your personality and style. Avoid following someone else rules that is based on one’s self opinion. Our most traditional collar, and often thought of as a more American collar. 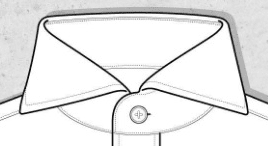 It has a narrower distance between the two collar points and, when buttoned, a smaller enclosure for a tie knot. An excellent choice and a classic look for the office. 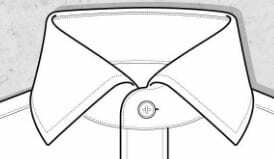 There is less room between the collar leafs than in a spread collar, which means it’ll accommodate a slimmer tie knot rather than a larger one. You’re a no-nonsense traditionalist who appreciates the classics. A work-horse collar and recommend to wear with a tie. A very popular collar alternative to the point collar is semi-spread collar. It accommodates a larger and smaller tie with ease. The spread gives a classic look and timeless option. This collar style accommodates both small and large tie knots due to the space between the collar leafs. Semi-Spread collars are generally very versatile and can be worn easily with a jacket and tie or on their own. One of the most popular choice. But if you have awfully big neck, would suggest to go for spread collar. 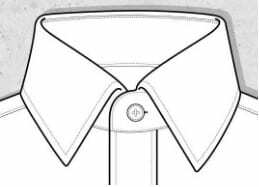 Called English spread collar, this collar has become more popular in recent years. It’s great to show off your tie knot. Looks confident and classy when worn with the collar button undone. The spread collar shirt is really your “no wrong answer” kind of shirt. It works in just about every situation imaginable, won’t get you in trouble for any kind of employer dress code/style violation and just looks damn good. Too easy. Most versatile collar and suit everyone. A cutaway collar is a bold, modern and sartorially-advanced style choice. Following the rigid, longer and narrower collars of the 1920s, the cutaway collar dress shirt emerged in the 1930s. The cutaway collar is not for everyone. It is the most fashion forward collar. If you’re at all on the fence about it, go with a spread collar instead. But if it’s your thing, it can be easily become “your look” for just about every kind of occasion, ranging from office to date to wedding. Confidence to wear the collar is the key. 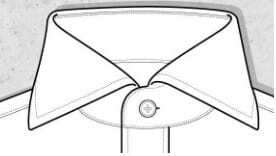 This collar fastens the collar points to the body of the shirt with buttons. It is gaining popularity more recently in business casual looks. The button down was originally invented for polo players to keep their collar points from moving during matches. It is best worn with collar button undone. Looks perfect with casual untucked shirt and also semi-formal shirt. Must not wear with a tie. This is a collar band with small collar points turned down at the front neck. Used for formal gatherings with a tuxedo this collar is not part of an everyday wardrobe. The “wings” hold your bowtie in place. Modern men have moved to wearing their bowties with point and spread collars in finer fabrics.